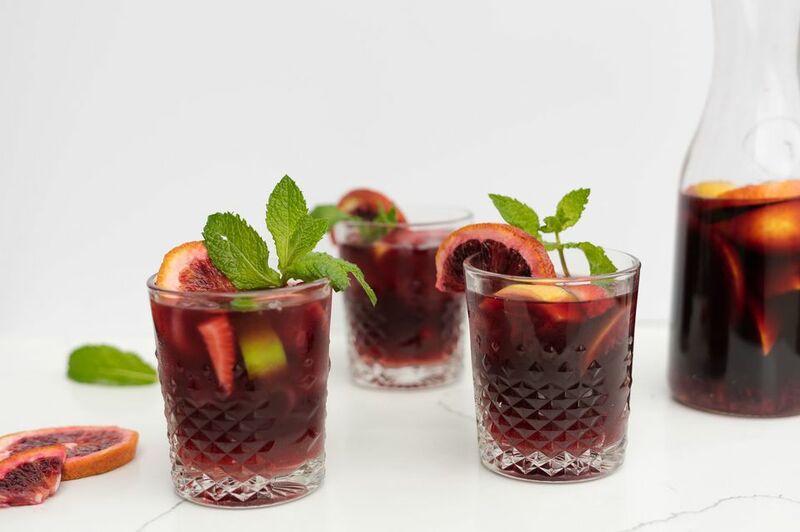 This particular sweet Sangria recipe is perfect for big summer parties, fall gatherings, and holiday festivities - always a favorite, you may consider doubling the recipe. With three forms of zesty citrus, topped with more red berries and diced pineapple, the fruit components marry well and marinate to form a brilliant backdrop to the fruit-forward wines suggested in this particular sangria recipe profile. Pour wine into a large pitcher and squeeze the juice wedges from the lemon, orange, and lime into the wine. Toss in the fruit wedges (leaving out seeds if possible) and pineapple then add sugar, orange juice, and gin. Chill overnight. Add ginger ale, berries, and ice just before serving. If you'd like to serve right away, use chilled red wine and serve over lots of ice. However, remember that the best Sangrias are chilled around 24 hours in the fridge - allowing the flavors to really marinate into each other. You can easily double-up on the fruit and mix and match citrus themes or add dashes of your favorite berry-based fruit instead. There is plenty of wiggle room for the recipe. Turn the sugar up or down based on personal preference or dietary restrictions. Keep in mind that the more time the Sangria fruit and wine have to marinate, the better the final drink. Shoot for a minimum of 2 to 3 hours and a max of 24 hours prior to serving. Best bed red wines for this party-themed sangria will be ones that carry their own forward red and black fruit themes. Also, don't spend more than $10 on wine for Sangria, since you are going for the juice and not the layered complexity found in more expensive wine finds. Zinfandel - not the pink stuff, we are going for the dense red wine, often with peppery undertones. Look for Lodi Zinfandel to grab some warm weather fruit.